What a year it has been! I honestly cannot believe it's 2015 - I remember when we were all anticipating the arrival of the 2000s... I rung in the year praying the world wouldn't collapse while wearing a t-shirt with a huge yellow smiley face on it... But, I digress. I always enjoy looking back at my favorite outfits of the year - I like to see the way my style has changed and it's fun to remember what was happening when I wore each outfit. It's posts like these that remind me how much I enjoy blogging - yeah, it's just clothes (who cares) but it's also a great online journal (and much less offensive than my Xanga days). So without further ado, my favorite outfits of the year, starting at the beginning of the year. 1. Green & White It's no secret that green is my favorite color, and I love that the green is really the only color happening here. 2. Leather Jacket I made a joke about feeling like a total poser in a leather jacket, but I really do love it. 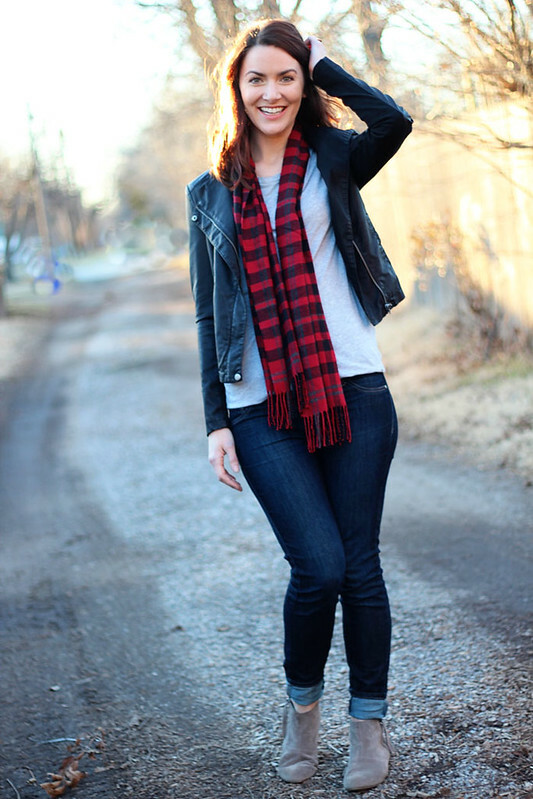 The jacket adds great texture to an otherwise simple outfit. 3. Floral Pants Since I try not to buy a lot of clothes, I really love making certain clothing items work for different seasons. 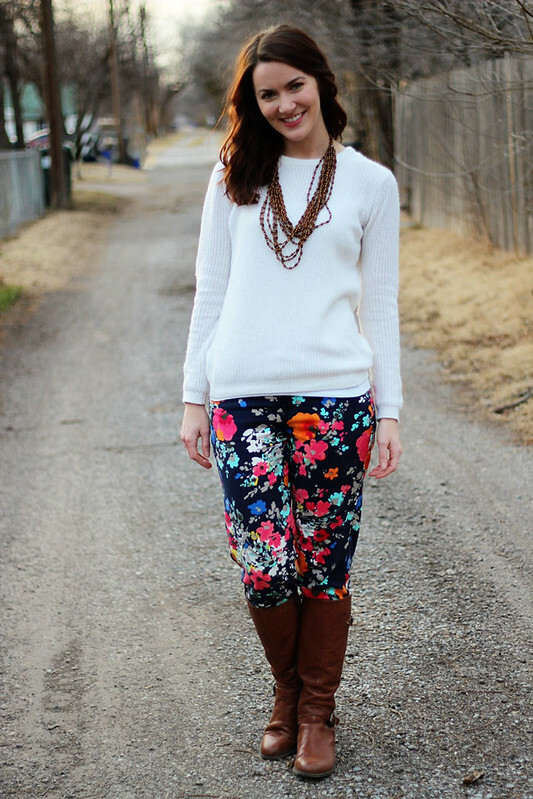 The chunky white sweater helps make these floral pants cold weather appropriate. 4. 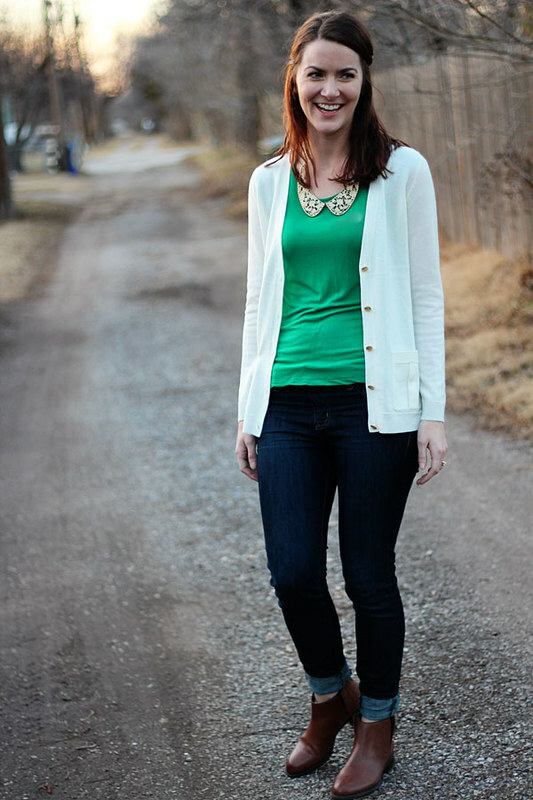 Chambray with white sweater and green jeans Ah, white sweater again, kelly green again. I am a creature of habit. 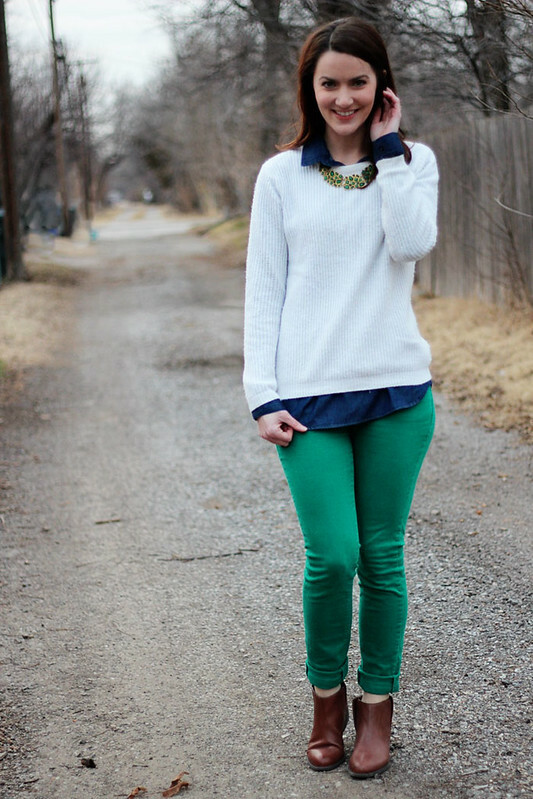 I love this outfit because of the layers and the simple colors. 6. 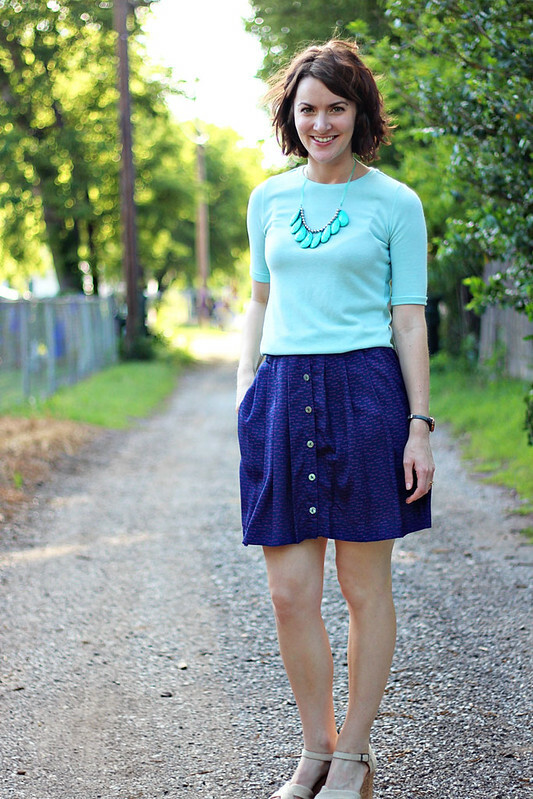 Purple Skirt with mint top First of all... short hair! Also, I knew I was pregnant in this picture - I had to wear the skirt really high to make it fit. Anyway, this was the first time I wore mint and purple together and I really loved it. 7. Anthro Dress with Blue Necklace You can never go wrong with an Anthropologie dress. 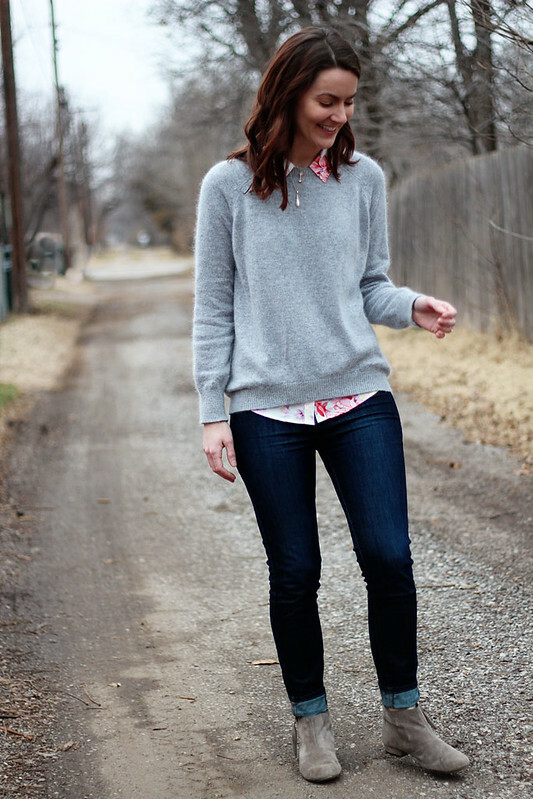 I love the fit and flare style with the subtle texture. 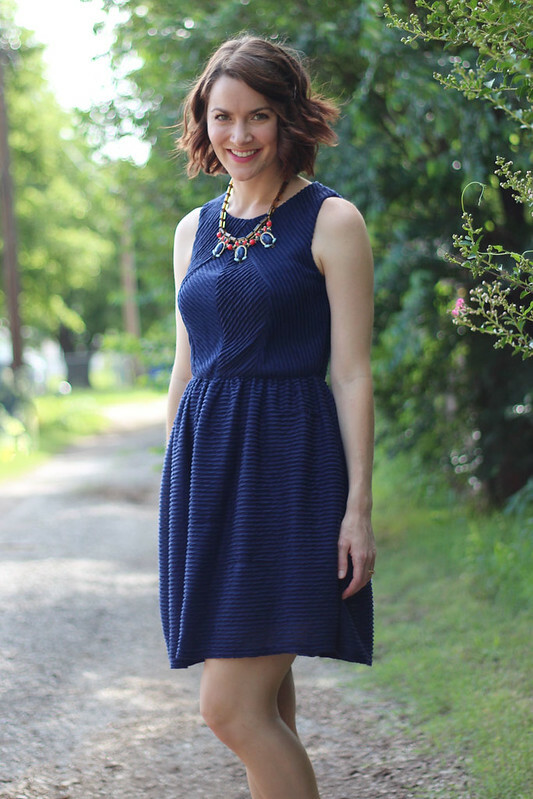 After this dress, I ended up purchasing a couple more navy dresses - turns out it's a great color (I used to dislike it!). 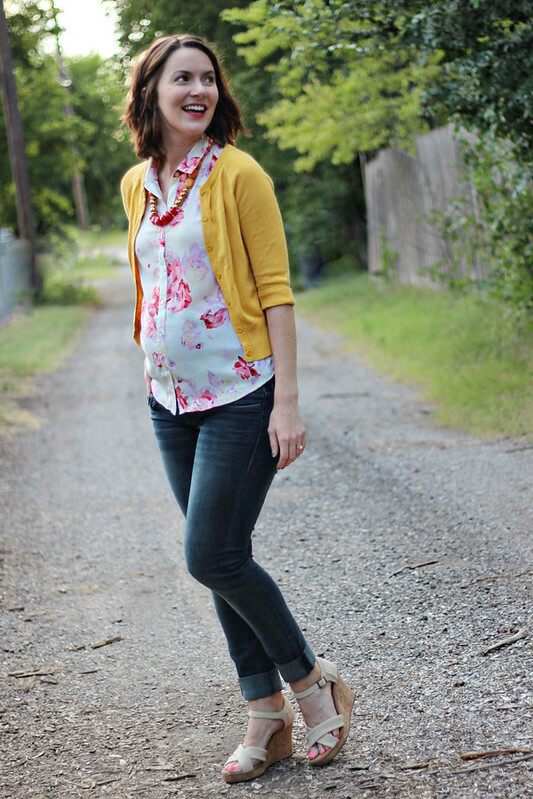 8. floral blouse with mustard cardigan This is the same floral blouse from #5 - this time paired with mustard yellow (and a baby bump) for spring. 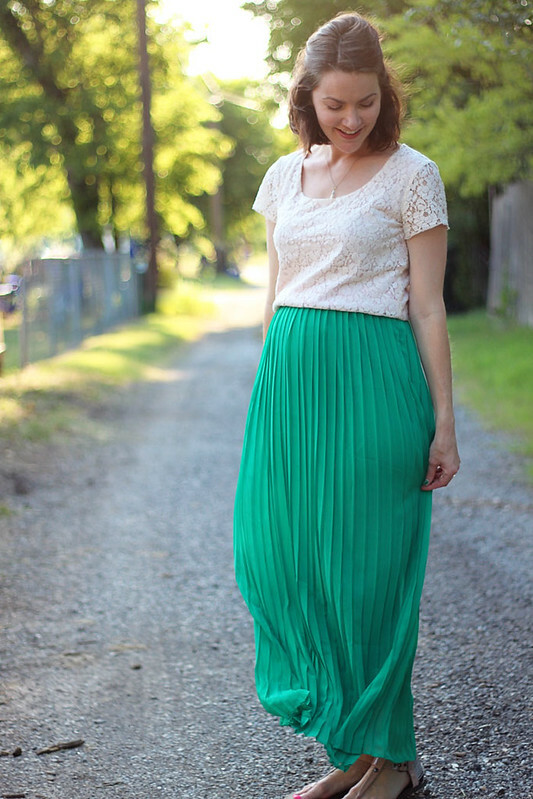 9. green maxi with lace top I had been eyeing this maxi skirt for a long time, so when it finally went on sale I was so excited! I was able to wear it with the bump for a while, which was nice. I haven't worn it since this photo was taken - so excited to pull it out for the spring! 10. 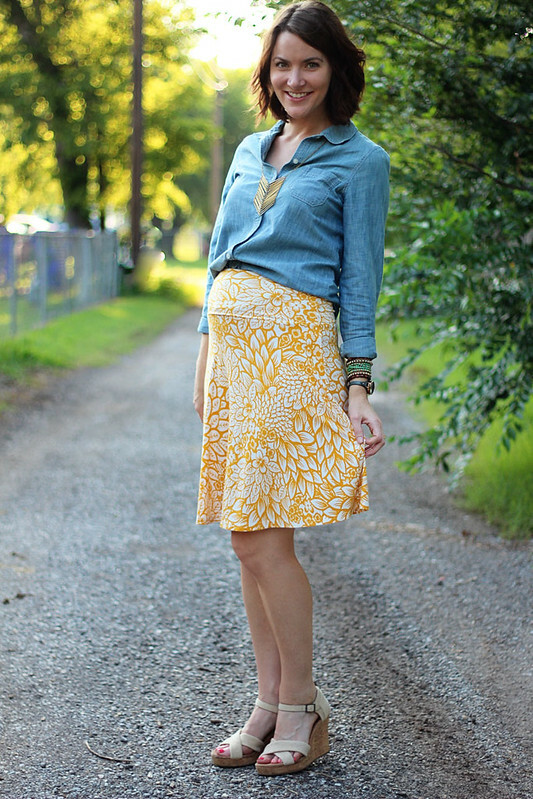 Yellow and Chambray I love the way this (non-maternity) skirt sits on my little belly. Also, the chambray shirt is my best friend. 11. Floral Dress with Utility vest The utility vest is another one of my favorite clothing items. This dress is great on its own, but the vest makes it more interesting. 12. Chambray with jeans Of course I had to get a maternity chambray shirt. I wore it a lot, but I really loved it paired with a dark pair of jeans and my favorite booties. 13. Sweatshirt Tunic This outfit makes me sad that I don't own the top in a non-maternity version. It's made of sweatshirt material and is super-comfy, which is a necessity when your belly is enormous. 14. Red sweater with plaid scarf I don't normally wear a lot of red, but I embraced it during pregnancy and I ended up loving it. 15. blue striped top with blue puffer vest I really love blue on blue, and it worked out really well considering this blue shirt was pretty much the only shirt that fit when this picture was taken. This was a weird year for me clothing-wise, for obvious reasons. I essentially had to build a wardrobe from scratch (though friends lent me a few items, which was wonderful!). It forced me to think about wardrobe basics and I had a really good time coming up with a variety of outfits out of a small amount of items. I preferred a much more muted color palate this year. It probably had to do with the fact that I had less of my closet to work with, but I could see it continuing through the next year. I have got to figure out how to fix my hair. These photos are fine, but in half of the ones from this year, my hair looks horrible. It made me laugh a lot - I'm really lazy when it comes to my hair so it's not surprising. But it's probably time for me to figure it out at 28 years old. The chambray is still the best shirt ever. Oh and I still love floral print more than anything else. If you're bored, you can look back at my favorite outfits of 2012 and my favorites of 2013. Which of the 15 is your favorite? i love those green jeans & the yellow dress! and everything really! love your style! It's so crazy to think of the changes you had in 2014 and that 2015 is already here!! These are great - and it's so fun to look back at the year. 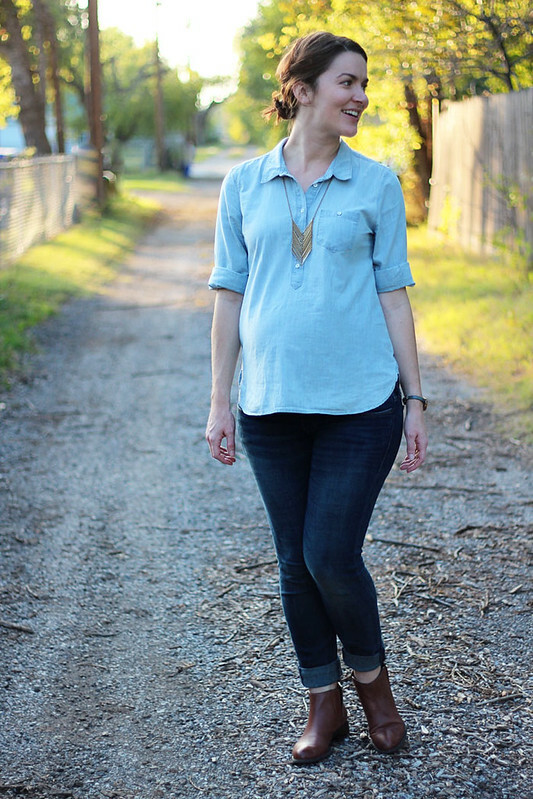 I've been thinking I should really buy a maternity chambray, because my favorite regular chambray is getting a little tight! Great looks! Navy does look wonderful on you! I love #8, probably because I'm so partial to mustard! You really are/were a cute pregnant lady. And, I was just admiring your hair. Isn't that funny? You are lucky to have volume and texture. Your recap is definitely one of my favorites because it is like story to baby (in my opinion). This is so sweet. I can't believe it's already 2015 either! Time just seems to fly by. I think your hair looks really cute :) The whole effortless long bob thing is very chic! Wow! You had so many great outfits! 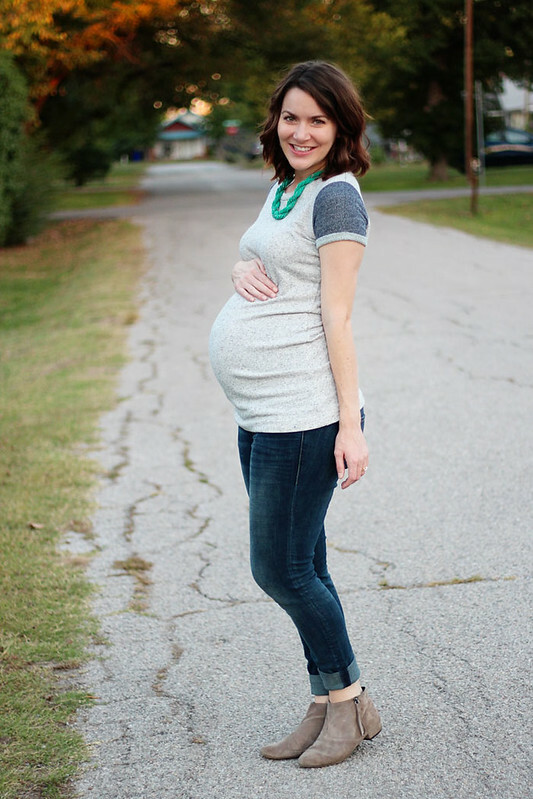 I really liked a lot of your maternity ones, but the kelly green pants outfit is by far my favorite. You always look so cute! 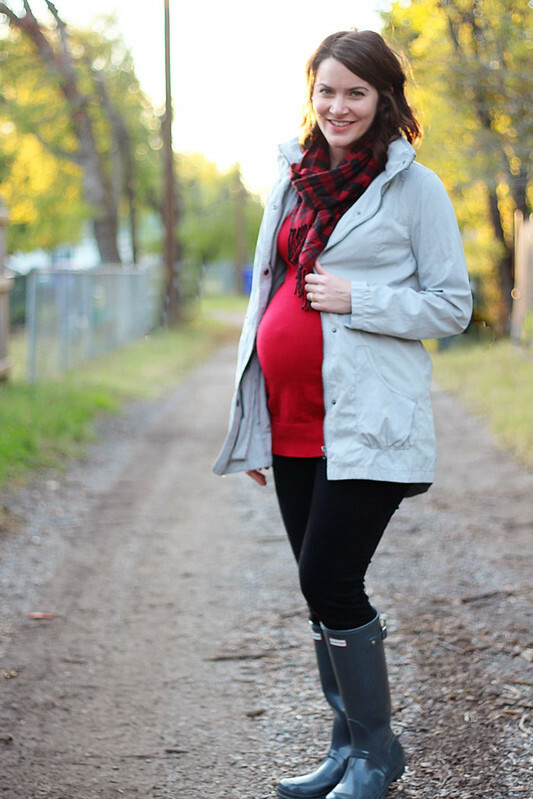 This is a great round up of outfits and it must be a bit surreal to look through the photos to see your growing belly! OMG that comment about remembering when it turned to the 2000s made me shudder a little because I thought that just happened. 15 years ago?!?! 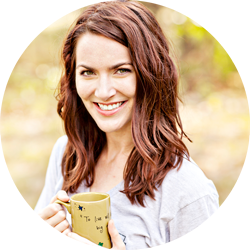 Love seeing this lineup for your year - fun to look back and see how things evolved, from hair cuts to baby bumps :) (I love your hair short and curled, by the way - I wish I could do that to mine!) I was also struck by lots of great layering, lots of cool rolled jeans but still great variety of outfits with them, and some fab necklaces in your last year. Happy 2015 - looking forward to seeing where it brings your style! So many great looks! 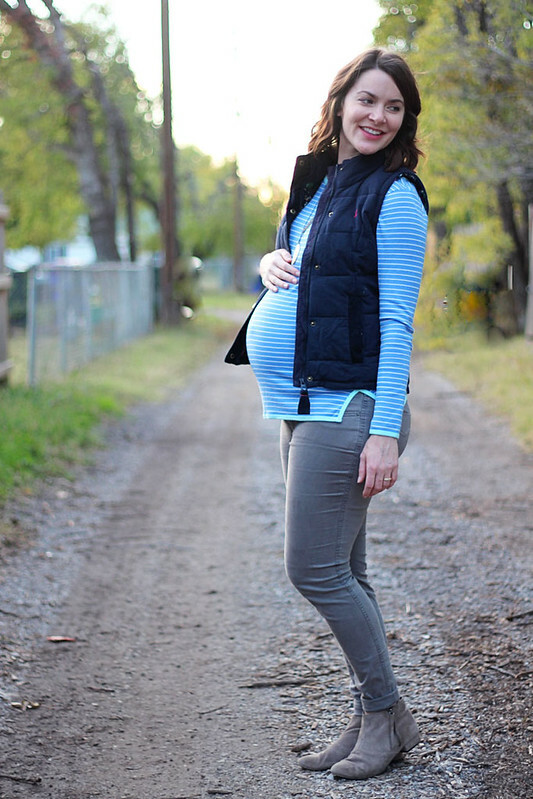 You had the cutest maternity outfits but my favorite is the chambray top, white sweater and green jeans! Great picks! Numbers 5 and 6 are my favorites. And your ankle boots served you well in 2014! You picked some great outfits!! I especially love the one with your leather jacket and the mustard cardigan. 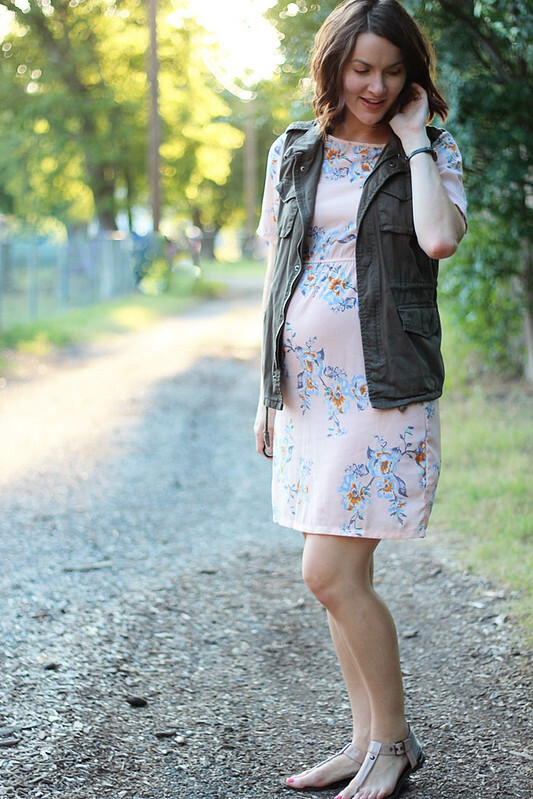 It's hard to dress a baby bump and you looked amazing in every outfit!